One of our most sought-after princess-cut diamond engagement rings with a 0.75 carat center stone (3/4 carat) set in the middle of two 0.33 carat (1/3 carat) diamonds which comprise the center of our three-stone princess-cut diamond engagement ring crafted in 14k white gold. The engagement ring also features 0.18 carats of round diamonds set along the band. This makes for a total of 1.59 Carats of white, sparkling diamonds in H Color, SI clarity (D-G Color, VS clarity diamonds available by request). Also available in 18k white gold or platinum (shown below). 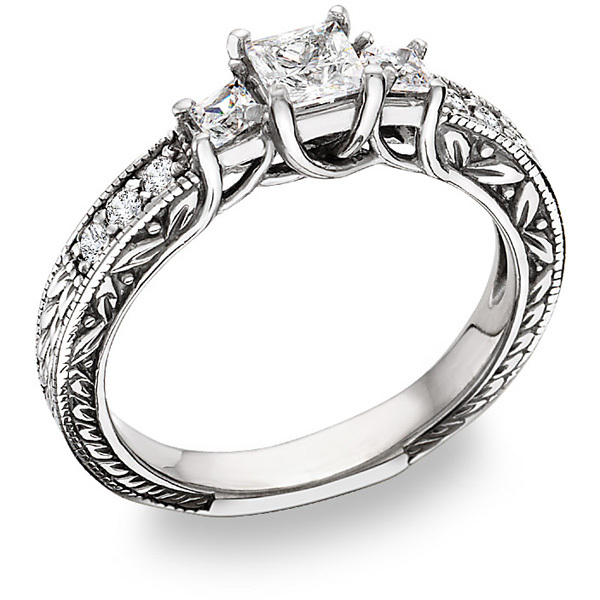 Our 1 1/2 carat three-stone princess-cut diamond floral ring is made here in the U.S.A. (diamonds are imported). Apples of Gold Jewelry guarantees the 1 1/2 Carat Three-Stone Princess-Cut Diamond Floral Engagement Ring to be of high quality and an authentic engagement ring with real diamonds, as described above.